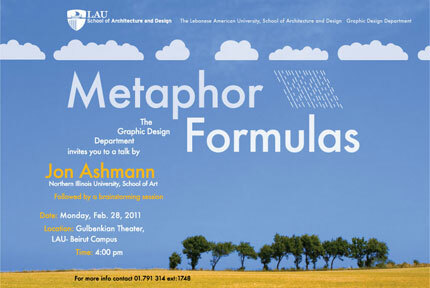 The lecture will be given by Jon Ashmann, professor at Northern Illinois University’s School of Art. The lecture will be followed by a brainstorming session. This lecture and workshop will introduce the importance of comparison and metaphor in human thought and communication. Comparison is the vehicle by which metaphor is constructed and formulated. A taxonomy of metaphor will be illustrated through the visual and verbal mode. Image-to-image, word-to-image, image-to-shape, and image-to-object comparisons will be examined. To facilitate one’s ability to apply ideas introduced, a clear formula will be presented that makes it possible for students and professionals to think metaphorically and to apply metaphor effectively in creating messages. We use our eyes to develop visual form. We use our minds to construct comparisons and metaphors that facilitate fresh, powerful and meaningful communication. Professor Jon Ashmann has taught in the Visual Communication Program at Northern Illinois University for the past 27 years. He has received international recognition for his design, having worked for over 40 Chicago and national companies. In 1995, he was honored with recognition for excellence in teaching at Northern, and in 1999, he received the “Above and Beyond Award” from the American Institute of Graphic Arts Chicago Chapter for design advocacy and contributions on the board and education committee. In 2010, he was nominated by the School of Art, Northern Illinois University, for the Outstanding International Educator Award. Ashmann has been invited to give numerous lectures at conferences and other events across the United States. He has traveled to over 90 countries worldwide and has the distinction of lecturing in Europe, Africa, Asia, North America, South America and the South Pacific, including Brazil, Canada, Cyprus, Egypt, England, France, Greece, India, Italy, Laos, Myanmar, New Zealand, Poland, Russia, Spain, Switzerland, Thailand, Turkey and Venezuela. He is a member of the National Art Education Association (NAEA); Foundations in Art: Theory and Education (FATE, past vice-president); International Society for Education through Art (INSEA); International Visual Literacy Association (IVLA), and American Institute of Graphic Arts (AIGA), Chicago Chapter (past board member and Education chair). For the past 20 years, he has presented papers at NAEA conferences across the United States. For more information, contact 01-791314 ext. 1748.